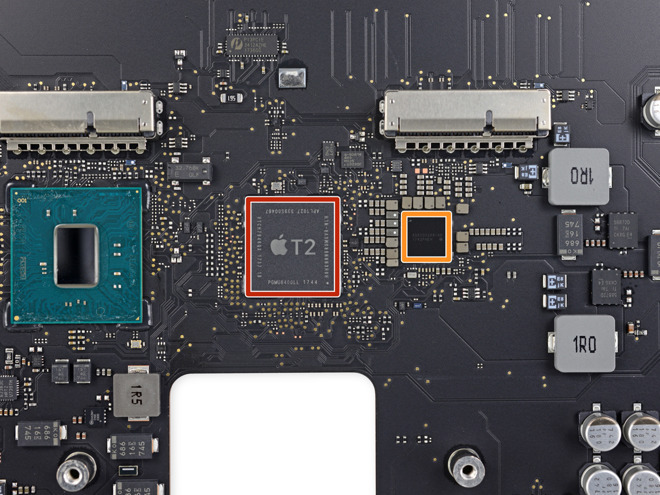 In taking apart the new iMac Pro, iFixit discovered an Apple chip identified as "338S00268," which the repair experts said "appears to be the rumored A10 Fusion coprocessor." Notably, the chip discovered near the solid-state hard drive is separate from the T2 chip, which handles secure booting, password encryption and more. The firm later recanted its hypothesis, saying the package is too small to contain an A10's innards. The discovery of a second Apple chip does, however, refuel speculation as to what exactly the hardware is for. Prior to the shipment of the iMac Pro, developers found indications in macOS High Sierra that an A10 processor could be included inside of the machine, generating rumors that the iMac Pro might boast always-on "Hey Siri" support and more. However, no such capabilities were found once the machine shipped, suggesting the custom silicon serves a different purpose. 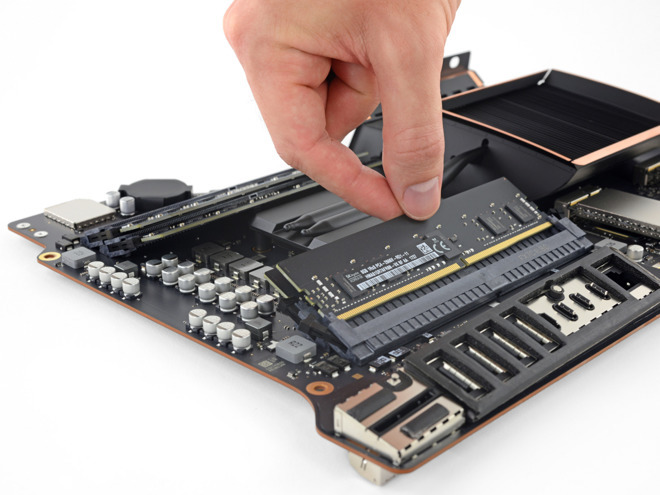 iFixit's teardown also found that upgrading the RAM on Apple's iMac Pro is a possibility, but not without a "major undertaking." After taking apart the machine, they found that the RAM used comes on standard 288-pin DDR4 ECC sticks. Accordingly, the solutions provider swapped in four 32-gigabyte modules for 128 gigabytes. 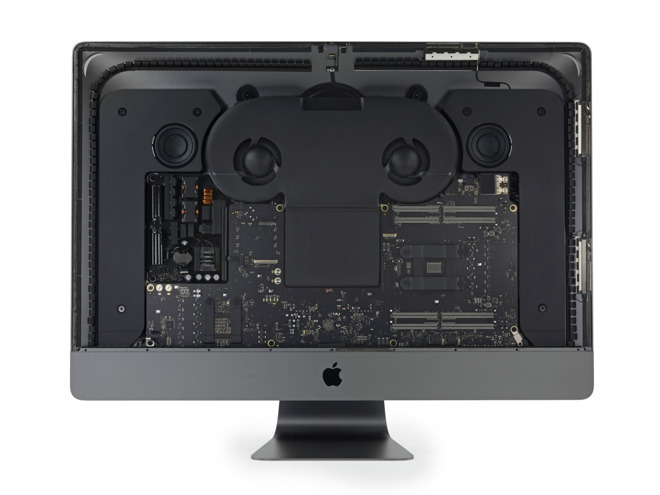 Less clear on upgradeability, however, is the CPU, which appears to have been custom-made for the iMac Pro. Assuming Intel sells compatible models to consumers at some point, replacing the CPU should be "theoretically possible," iFixit said. One thing that won't be upgraded, however, is the graphics card, as iFixit found that the GPU is soldered in place. Though iFixit only gave the iMac Pro a repairability score of 3 out of 10, the site did say that the machine "goes back together just fine." they plan to offer a step-by-step upgrade guide soon. Update: In a subsequent tweet, iFixit said the mystery chip is too small to be an A10 Fusion coprocessor. "Whoops! We initially thought this Apple 338S00268 chip was the rumored A10 Fusion coprocessor, but the package size is too small (roughly 7.4 mm each side). What do you think it is? Maybe a PMIC of some sort?" iFixit said. The story has been updated to reflect iFixit's statement.